Partly cloudy skies in the morning will give way to cloudy skies during the afternoon. High around 80F. Winds SW at 10 to 20 mph..
Cloudy skies early, followed by partial clearing. Slight chance of a rain shower. Low 56F. Winds W at 5 to 10 mph. 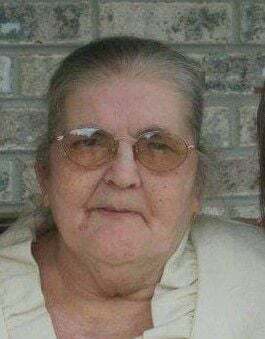 Molly Jane Herald, age 78, of Talbert, Ky., passed away on Sunday, April 14, 2019 at the Nim Henson Nursing Home in Jackson, Ky. She was born March 11, 1941 at Talbert, Ky., and was the daughter of the late Jerry and Ida (Raleigh) Herald. She was preceded in death by two sisters: Lizzie McIntosh and Ellen Herald. She is survived by her husband: Johnny Herald of Talbert, Ky.; one daughter: Ida (Victor) Turner of Turkey Creek, Ky.; two sons: James (Pearlie) Herald of Talbert, Ky.; Jesse Wade Herald of Talbert, Ky.; three grandchildren: Jonathan Turner, Cora Tillett and Jamie Turner; four great grandchildren: Tessa Wyrick, Daylan Wyrick, Annabelle Turner, and Caleb Turner. Funeral services were held on Wednesday, April 17, 2019 at 11 a.m. at the Turners Creek Church of Christ with Silas Hall, Jesse Hall, JR and Paul Hall officiating. Burial in the Hall and Herald Cemetery, Talbert, Ky. Visitation on Tuesday at 5 p.m. at the church. Deaton Funeral Home in charge of arrangements. Pallbearers: family and friends.